Q: Why don’t I just offer free PDF files of all my music? A: I realize that selling my music goes against the new model of so called ‘free online music.’ However, please remember I spend most of my time practicing, sketching, developing, creating and notating these compositions and arrangements for TAB users and score readers. Each piece is an expression of how I see the world, and it is a true honor and pleasure to share them with you. But I must be able to make at least a modest living on my music or I will not have the chance to create my music. In other industries, no one is expected to work for free. Q: What is the best/easiest way to shop? A: 1. Find your scores and TABs in the menu or download the free catalog. A: You must download the files you ordered. We will only ship (for free) the “Per-Olov Kindgren Playbook”. Important: you have to provide us with a valid and working email address. If you don’t, you will not be able to get the file(s) you just purchased. Once your payment has been accepted, you will receive an email to that email address identifying your username and password. Please follow the instructions in the email. If you haven’t received the instructions within 15 minutes, please check your spam folder. If you still can’t find the email please contact us as soon as possible for assistance. Some ISP (Internet Service Provider), such as comcast.net and others has a strong SPAM blocking system and might block my emails. Please be sure to add me to your trusted senders! Q: I never received a download link! What do I do? A: Some ISP (Internet Service Provider), such as comcast.net and others has a strong SPAM blocking system and might block my emails. Please be sure to add me to your trusted senders and ALSO CHECK YOUR SPAM FOLDER/FILTER! Please click on the (underlined) link after the word: Download. Your browser should open and download the file. If not, you can right click on the link and copy it. You can also access the file(s) directly after you ordered the music! Once PayPal accepted your payment, you will automatically be taken back to my shop to the page where you can download it. PLEASE MAKE A BACKUP OF THE FILES! WE KEEP RECORDS OF YOUR ORDER FOR ONE (1) YEAR ONLY. AFTER THAT TIME PERIOD, YOU WILL HAVE TO RE-ORDER THE MUSIC IF YOU LOST IT. Q: How long time do I have to download my purchase? A: After your purchase you will be able to download the files as long as my site exists but you can only download it five (5) times. You will need the latest version of Adobe Acrobat Reader to open the files. You can get it for free by clicking here. Q: What format are the scores/TABs in? A: The file(s) you download are in PDF-format. You will need a PDF reader to open and print them. You can get it for free by clicking here. Some of the files are Zipped (for easy, trouble free download). Just double click the ZIP-file and drag the PDF file inside to your desktop. Q: How soon do I receive the music I just ordered from Per-OlovKindgren.com? A: Within minutes! We send you a download link to the email address that you provide. Simply follow the instructions to download the music. That is all there is to it! NOTE: The only item we ship with ordinary post mail (Free shipping) is Per-Olov Kindgren PlayBook . When buying Per-Olov Kindgren PlayBook you have to provide us with your correct email and home address! Note: Customers from countries mentioned below will not be able to order these items anymore due to insecure delivery in those countries. Orders from CHINA, LATIN AMERICA, CENTRAL AMERICA, THE PHILIPPINES, MALAYSIA, AFRICA (excluding South Africa), VIETNAM and INDONESIA will not be shipped! You will receive a refund minus a fee of 5% of the order. Q: Who is handling my transaction? A: The complete transaction is handled by the PayPal secure server system with a strong encryption. 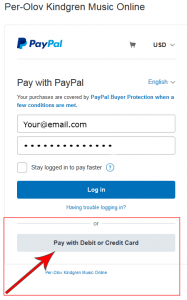 NOTE: PayPal is responsible for handling the credit card and other payment details. You can pay with any major credit card or VISA without registering. See how by clicking here. Q: Why can’t I find all the pieces you play on the Internet in your web shop? A: I need the Copyrights for some pieces to be able to sell them. I am constantly working on it, but it is very difficult and expensive. You have to DOWNLOAD your music (Except the “Per-Olov Kindgren PlayBook”). Please enter a valid email address at checkout. You will receive an email with instructions how to download your selections. Please follow them carefully. If you haven’t received the instructions within 15 minutes, please check your spam folder. If you still can’t find the email please contact us as soon as possible for assistance. The website located at www.per-olovkindgren.com (the “Site”) is a copyrighted work belonging to Per-Olov Kindgren (“Company”, “us”, “our”, and “we”). Through the Site, Company provides certain services, including its online service that enables users to purchase downloads for, and view and print, certain sheet music, tablatures, mp3 and books (such services collectively, the “Services”). THESE TERMS AND CONDITIONS (THE “AGREEMENT”) SET FORTH THE LEGALLY BINDING TERMS FOR YOUR USE OF THE SITE, SERVICES, AND THE SHEET MUSIC, APPLICATIONS, AND OTHER MATERIALS PROVIDED THROUGH THE SITE. BY ACCESSING OR USING THE SITE, SERVICES, OR ANY SHEET MUSIC, APPLICATION, OR OTHER MATERIAL PROVIDED THROUGH THE SITE, (1) YOU REPRESENT THAT “YOU” ARE THE INDIVIDUAL THAT REGISTERS FOR AN ACCOUNT ON THE SITE, (2) YOU ARE OF SUFFICIENT LEGAL AGE IN YOUR JURISDICTION TO CREATE BINDING LEGAL OBLIGATIONS, AND (3) YOU ACKNOWLEDGE THAT YOU HAVE READ, UNDERSTOOD, AND AGREE TO BE BOUND BY THIS AGREEMENT. IF YOU CANNOT MAKE ANY OF THE FOREGOING REPRESENTATIONS, DO NOT ACCESS OR USE THE SITE OR SERVICES OR USE ANY SHEET MUSIC, APPLICATION, OR OTHER MATERIAL PROVIDED THROUGH THE SITE. 1. ACCOUNT. In order to use certain features of the Site (for example, to use the Services), you must register for an account on the Site (“Account”) and provide certain information about yourself as prompted by the Site registration form. You represent and warrant that: (a) all required registration information you submit is truthful and accurate and (b) you will maintain the accuracy of such information. You may delete your Account at any time, for any reason, by contacting Customer Service. You are responsible for maintaining the confidentiality of your Account login information and are responsible for all activities that occur under your Account. You agree to immediately notify Company of any unauthorized use or suspected unauthorized use of your Account or any other breach of security. Company will not be liable for any loss or damage arising from your failure to comply with the above requirements. 2. ORDERS AND PAYMENT. You may place an order to purchase a license to any Item (as defined in Section 3.1 below) or to purchase any material offered for sale on the Site subject to the terms of this Agreement. YOU HEREBY AUTHORIZE COMPANY TO BILL YOUR CREDIT CARD OR PAYMENT ACCOUNT THE FEES LISTED ON THE SITE FOR THE ITEM OR MATERIAL ORDERED BY YOU. Fees are exclusive of all taxes, levies, or duties imposed by taxing authorities, and you are responsible for payment of all such taxes, levies or duties. 3.1 License Grant. Subject to the terms of this Agreement, Company grants you a limited, non-transferable, non-exclusive license, to: (a) print one (1) physical copy of each Item solely for your use and to view on your browser each Item solely as provided through the Services and solely for your use; (b) install one (1) copy of the Application on your computer and execute the Application, in executable code only, solely for your use in conjunction with the Services; and (c) otherwise access the Site and Services solely for your own use. An “Item” means a single license unit (as designated by Company) of specific sheet music listed in Company’s then-current sheet music catalog posted on the Site. 3.3 Ownership. You acknowledge that all the intellectual property rights, including copyrights, patents, trade marks, and trade secrets, in the Site, Services, Items, Applications, and other materials provided through the Site, are owned by Company or Company’s suppliers. The provision of the Site, Services, Items, Applications, or other materials provided through the Site, does not transfer to you or any third party any intellectual property rights thereto. Company and its suppliers reserve all rights not granted in this Agreement. Company grants no implied licenses in this Agreement. 3.5 Third Party Software. You acknowledge that certain features of the Site or Services or certain Applications may require the use of separate third party software (for example, Flash), which you must download on to your computer from the site of the licensor of such third party software. Such third party software is governed by the license agreement provided by the licensor of such third party software and not this Agreement. 4. NECESSARY EQUIPMENT. You are solely responsible for ensuring that your computer, printer, and related equipment are in good working condition and have the necessary connectivity to access the Site and Services. Company will not be liable to you for any inability to print any Item resulting from or relating to your computer, printer, or related equipment, or connectivity issues. 5. MODIFICATION. Company reserves the right, at any time, to modify, suspend, or discontinue, in whole or in part, the Site (including your Account) and/or any Service, Item (including your ability to view or print any Item for which you have purchased a license hereunder), Application, or other material provided through the Site, with or without notice. Upon purchase of a license to any Item, you should immediately print such Item in accordance with this Agreement and carefully retain such print copy in your records. You agree that Company will not be liable to you or to any third party for any modification, suspension, or discontinuance of, in whole or in part, the Site (including your Account) and/or any Service, Item (including your ability to view or print any Item for which you have purchased a license hereunder), Application, or other material provided through the Site. 8.1 Third Party Sites & Ads. The Site may contain links to third party websites, services, and advertisements for third parties (collectively, “Third Party Sites & Ads”). Such Third Party Sites & Ads are not under the control of Company and Company is not responsible for any Third Party Sites & Ads. Company provides these Third Party Sites & Ads only as a convenience and does not review, approve, monitor, endorse, warrant, or make any representations with respect to Third Party Sites & Ads. You use all Third Party Sites & Ads at your own risk. When you link to a Third Party Site & Ad, the applicable third party’s terms and policies apply, including the third party’s privacy and data gathering practices. You should make whatever investigation you feel necessary or appropriate before proceeding with any transaction in connection with such Third Party Sites & Ads. 9. DISCLAIMER. THE SITE, SERVICES, ITEMS, APPLICATIONS, AND OTHER MATERIALS PROVIDED THROUGH THE SITE ARE PROVIDED “AS-IS” AND “AS AVAILABLE” AND WE (AND OUR SUPPLIERS) EXPRESSLY DISCLAIM ANY WARRANTIES AND CONDITIONS OF ANY KIND, WHETHER EXPRESS OR IMPLIED, INCLUDING THE WARRANTIES OR CONDITIONS OF MERCHANTABILITY, FITNESS FOR A PARTICULAR PURPOSE, SATISFACTORY QUALITY, TITLE, QUIET ENJOYMENT, ACCURACY, AND NON-INFRINGEMENT. WE (AND OUR SUPPLIERS) MAKE NO WARRANTY THAT THE SITE, SERVICES, ITEMS, APPLICATIONS, OR OTHER MATERIALS PROVIDED THROUGH THE SITE, (A) WILL BE AVAILABLE ON AN UNINTERRUPTED OR TIMELY BASIS, (B) WILL MEET YOUR REQUIREMENTS, OR (C) WILL BE ACCURATE, RELIABLE, FREE OF VIRUSES OR OTHER HARMFUL CODE, COMPLETE, OR SECURE. SOME JURISDICTIONS DO NOT ALLOW THE EXCLUSION OF IMPLIED WARRANTIES, SO THE ABOVE EXCLUSION MAY NOT APPLY TO YOU. 10. LIMITATION ON LIABILITY. TO THE MAXIMUM EXTENT PERMITTED BY APPLICABLE LAW, IN NO EVENT SHALL WE BE LIABLE TO YOU OR ANY THIRD PARTY FOR ANY LOST PROFIT, LOST DATA, LOST ITEM, OR ANY INDIRECT, CONSEQUENTIAL, EXEMPLARY, INCIDENTAL, SPECIAL OR PUNITIVE DAMAGES ARISING FROM OR RELATING TO THIS AGREEMENT OR YOUR USE OF, OR INABILITY TO USE, THE SITE, SERVICES, ITEMS, APPLICATIONS, OR OTHER MATERIALS PROVIDED THROUGH THE SITE, EVEN IF WE HAVE BEEN ADVISED OF THE POSSIBILITY OF SUCH DAMAGES. USE OF THE SITE, SERVICES, ITEMS, APPLICATIONS, AND OTHER MATERIALS PROVIDED THROUGH THE SITE, ARE AT YOUR OWN DISCRETION AND RISK, AND YOU WILL BE SOLELY RESPONSIBLE FOR ANY DAMAGE TO YOUR COMPUTER SYSTEM OR LOSS OF DATA RESULTING THEREFROM. TO THE MAXIMUM EXTENT PERMITTED BY APPLICABLE LAW, OUR LIABILITY TO YOU FOR ANY DAMAGES ARISING FROM OR RELATED TO THIS AGREEMENT AND YOUR USE OF, OR INABILITY TO USE, THE SITE, SERVICES, ITEMS, APPLICATIONS, OR OTHER MATERIALS PROVIDED THROUGH THE SITE, FOR ANY CAUSE WHATSOEVER AND REGARDLESS OF THE FORM OF THE ACTION, WILL AT ALL TIMES BE LIMITED TO THE AMOUNT PAID BY YOU TO THE COMPANY FOR THE ITEM, APPLICATION, OR OTHER MATERIAL PROVIDED THROUGH THE SITE THAT GIVES RISE TO THE LIABILITY. THE EXISTENCE OF MORE THAN ONE CLAIM WILL NOT ENLARGE THIS LIMIT. YOU AGREE THAT COMPANY’S SUPPLIERS WILL HAVE NO LIABILITY OF ANY KIND UNDER OR AS A RESULT OF THIS AGREEMENT.SOME JURISDICTIONS DO NOT ALLOW THE LIMITATION OR EXCLUSION OF LIABILITY FOR INCIDENTAL OR CONSEQUENTIAL DAMAGES, SO THE ABOVE LIMITATION OR EXCLUSION MAY NOT APPLY TO YOU AND YOU MAY ALSO HAVE OTHER LEGAL RIGHTS THAT VARY FROM JURISDICTION TO JURISDICTION. 11. TERM AND TERMINATION. We may terminate this Agreement, at any time for any reason at our sole discretion, including for any use of the Site, Services, Items, Applications, or other materials provided through the Site, in violation of this Agreement or in connection with Section 5 above. Upon termination of this Agreement, your Account and all licenses granted to you hereunder will terminate immediately. Company will not have any liability whatsoever to you for any termination of this Agreement. Even after this Agreement is terminated, the following provisions of this Agreement will remain in effect: Sections 3.2, 3.3, 3.4 and 6 through 12. 12.2 Changes to Agreement. This Agreement is subject to occasional revision, and if we make any substantial changes, we may notify you by sending you an e-mail to the last e-mail address you provided to us (if any) and/or by prominently posting notice of the changes on our Site. Any changes to this Agreement will be effective upon the earlier of thirty (30) calendar days following our dispatch of an e-mail notice to you (if applicable) or thirty (30) calendar days following our posting of notice of the changes on our Site. These changes will be effective immediately for new users of our Site or Services. You are responsible for providing us with your most current e-mail address. In the event that the last e-mail address that you have provided us is not valid, or for any reason is not capable of delivering to you the notice described above, our dispatch of the e-mail containing such notice will nonetheless constitute effective notice of the changes described in the notice. Continued use of our Site or Services following notice of such changes shall indicate your acknowledgement of such changes and agreement to be bound by the terms and conditions of such changes. 12.5 Electronic Communications. The communications between you and Company use electronic means, whether you use the Services or Site or send us emails, or whether Company posts notices on the Site or communicates with you via email. For contractual purposes, you (a) consent to receive communications from Company in an electronic form; and (b) agree that all terms and conditions, agreements, notices, disclosures, and other communications that Company provides to you electronically satisfy any legal requirement that such communications would satisfy if it were in a hard copy writing. The foregoing does not affect your non-waivable rights. 12.6 Copyright/Trademark Information. Copyright © 2015, Per-Olov Kindgren Music Online. All rights reserved. All trademarks, logos and service marks (“Marks”) displayed on the Site are our property or the property of other third parties. You are not permitted to use these Marks without our prior written consent or the consent of such third party which may own the Marks.